It’s the dream everyone shares: How can I get control of my time and my life? How can I achieve maximum success in my career and still achieve balance in my relationships and my personal life? How can I have it all and still be happy and fulfilled? More often, these questions need to be asked because if your life is like that of the majority of Americans, you have too much to do and too little time. Obligations and responsibilities pile up, one on top of the other, and there are rarely enough hours in the day to get through them all. You may be earning more money and doing better than you’ve ever done before. But what do you do if you feel overwhelmed with the demands of your job and your personal life? What do you do if you are working harder than ever before, yet you are getting less and less satisfaction and enjoyment from what you do? 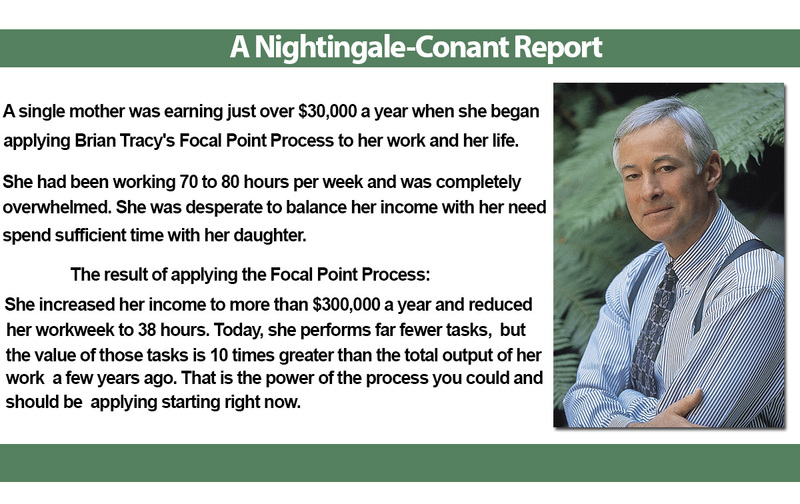 Bestselling author Brian Tracy offers an easy solution: the Focal Point Process. With it, you can develop maximum focus and clarity in the critical areas of your life that will make the difference you need and desire. With minimal effort, your income and your free time will double. The Power of Clarity explains why and how some people accomplish vastly more than others in each of the important areas of their lives. It shows you how you too can accomplish more in your work while simultaneously having much more time to spend with your family and on your personal activities. This course is a synthesis of the best ideas and strategies on personal management ever brought together in one place, in one simple, easy-to-use plan. It shows you how to organize and simplify your life in the seven critical areas that are essential for complete balance and true peace of mind. The central concept of the course is the principle of “clarity.” Clarity is everything. To perform at your very best and double your productivity, you must be absolutely clear about what it is you want to accomplish. You must then identify and pursue the very best way to go about achieving it. The Power of Clarity will show you how to do that and more. The results Brian Tracy’s clients achieve from the systematic application of these strategies to their lives and work are often amazing. Participants in his programs, and others who apply these principles, report both rapid and increasing improvements in every area. They often double their incomes, reduce the number of hours they work each week, get control of their time and their lives, and dramatically improve the quality of their relationships with their families and other people. 1. You can do more of certain things. 2. You can do less of certain things. 3. You can start to do things that you are not doing at all today. 4. You can stop doing certain things altogether. The Power of Clarity will show you what specific activities to do more of and less of, and it will tell you what new activities to start and what old activities to stop. Even if you are earning more money and doing better than you have ever done before, think about how you are balancing your job and your personal life. It's not worth it to work harder and harder for more money but less satisfaction and enjoyment. The Power of Clarity gives you the solution to these unavoidable challenges of modern life. There are virtually no limits to what you can be, do, or have when you apply the Focal Point Process to your life. The more you focus on doing those few things that represent the most valuable use of your time, the better you become at those activities and the less time it takes you to accomplish each one. Your returns on effort and energy increase, the more of them you do. With The Power of Clarity, you’ll discover the keys to doubling your income and doubling your time off. If you’d like more money and more time to enjoy it, this course will show you how to have both! If you want anything badly enough and you are willing to use The Power of Clarity to guide you toward your goal, nothing can stop you from achieving it. P.S. It doesn’t matter where you’re coming from; all that matters is where you’re going. Never allow yourself to be slowed down or held back by events that have occurred in your past. Learn from them and let them go. Resolve to keep yourself focused on the future and where you are going. With The Power of Clarity, there are no limits to what you can achieve in the months and years ahead. Review your Free-Trial offer and accelerate your progress dramatically. YES, I want to discover the simple process that will enable me to earn more, achieve more, and be more… with minimal effort. 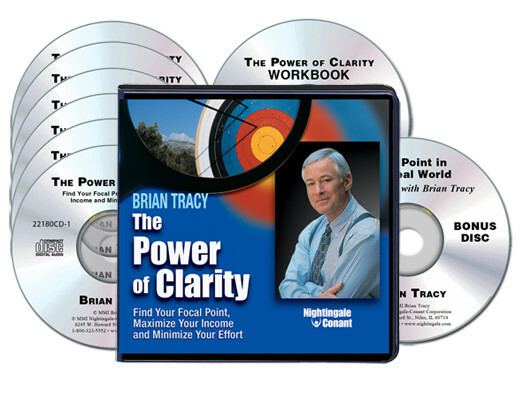 Please send me Brian Tracy's audio program The Power of Clarity - including 6 Audio CDs, Workbook on CD, Bonus CD - for just $57.95, which is 75% OFF the regular program price. Take advantage of this limited-time special discount now! If I do not find the principle of clarity helpful in 30 days, I can return this program for a full refund. No questions asked.